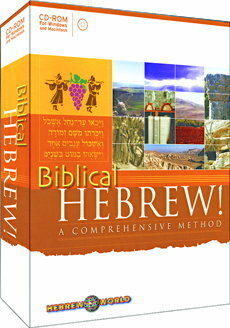 Hebrew World (formerly a Davka product) Biblical Hebrew RRP £79.95 (inc VAT) / $95. BMSoftware price �72 In stock (Disk) Biblical Hebrew is Everything you need to master reading, writing, analyzing, and translating Biblical Hebrew! Includes audio pronunciation, Hebrew text and English translation of the complete Bible. 1000 word vocabulary, 150 hours teaching, 200 exercises, 28 lessons. Biblical Hebrew is compatible with Microsoft Windows XP/Vista/7/8, Apple OS X. Buy now. More Davka software or check out other Hebrew software. Complete Hebrew & Jewish software price list. Any questions prior to purchasing email us or call 0844 808 3699. This program includes everything you need to master reading, writing, analyzing, and translating Biblical Hebrew! 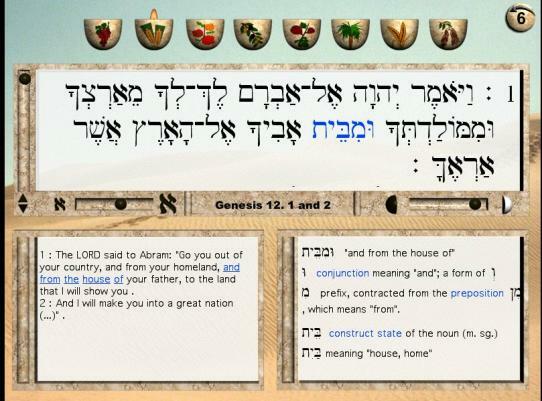 Featuring 28 interactive and dynamic lessons, Biblical Hebrew contains a wealth of fascinating information, including summaries of each book of the Bible and a colourful atlas of Biblical maps. Biblical Hebrew Vocabulary - Instant translation of all words that appear in the text. Dictionary - Versatile Hebrew-English dictionary contains over 1000 words. Comprehensive Exercises - Complete set of grammar and language lessons for each unit. Biblical History and Geography - A memorable journey into Biblical geography, history and culture, with a colorful Bible atlas, descriptions of the leading Biblical figures, summaries of the books of the Bible and more. Please Email or Call 0844 808 3699 to enquire about site licenses, network versions, bulk discounts, reseller/trade orders or educational/institutional pricing. We are sorry but no free, trial or download versions are available for this software title. Cheaper earlier versions may be available or you may purchase and return your product unopened, uninstalled for a refund. Some products may have a manufacturer satisfaction warranty of up to 60 days which we/they will honour. On some products we offer a 30 day exchange for another similar or better product or guarantee up to a 90 day 90% credit upgrade to an improved or superior software title. On some products competitive upgrade pricing or part-exchange may be available. We accept bank transfers, cash, cheques, credit cards (MasterCard, Visa etc), debit cards (Electron, Maestro, Solo, Switch, Visa debit), part exchange, paypal, postal orders, stamps, Western Union. Some payment methods may be surcharged, transparently based on but never more than the costs to us of processing a particular method. Some methods of payment are not avaialable to all countries.